One of the key drivers to a healthy housing market is the ability of move up buyers to sell their homes and use their equity to move to bigger homes. Likewise, a healthy housing market should have sufficient demand to accommodate the downsizing buyers as well. The move-up buyers are especially important however, because they typically provide homes to the market that are appropriate for first time buyers. We saw home prices sky rocket during the bubble years. Currently, home prices again, are up significantly, but not back to bubble year highs when adjusted to inflation. The debt leverage nature of the long run up in home prices during the housing bubble years to the crash, meant that many homeowners didn’t build up equity. Even today this is the case for some homeowners who still have some of the housing bubble debt on their books. The lack of selling equity means would-be move-up buyers are stuck in their homes—unable to use equity in their existing home for a financially sensible down payment on the next one. When we look at the existing home sales report, we see year over year growth in sales demand from a very low bar set in the previous year, but inventory remains low. I suggest one of the reasons for this lack of inventory is the direct result of would be buyers being stuck in their existing home, due to lack of selling equity. In fact, outside of the years of the housing bust, we haven’t had an average of 6 months on-sale inventory anytime this century. The NAR report this year shows that 2015 was no better than 2014, even in year 7 of the economic cycle with healthy price gains since the spring of 2012. 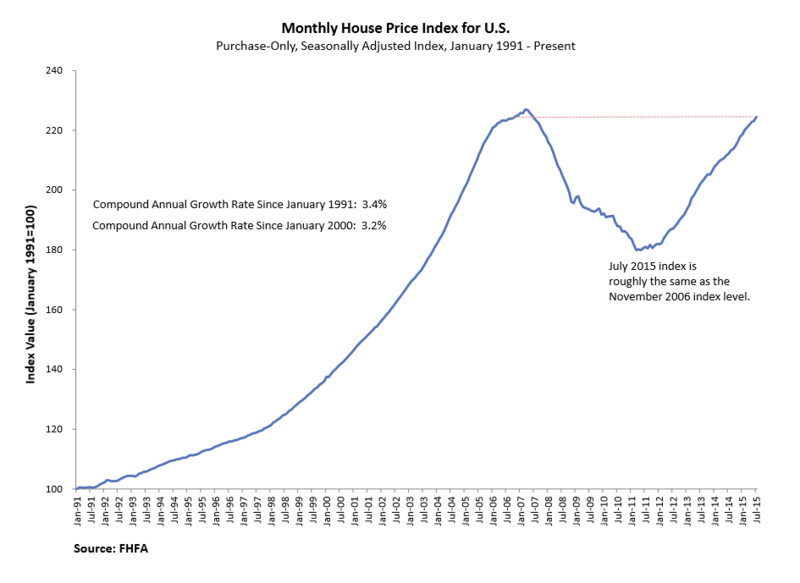 Having 6 months of inventory this century has been a challenge for the housing market as shown below. If we use the U.S. affordability index, the traditional move up buyer, needs to have 28%-33% equity in order to have the ability to sell their home, pay the transaction costs and still have money left over for a 20. down payment. . In my business here in Southern California, what I have seen this year is that some move up home buyers have been able to make down payments of 20% and more making the total debt payment less. Last year all the move up buyers that I saw were making down down payments of 5% -10%, so I have seen the positive effects of higher price gains in this regard. For some home buyers they still need higher prices to have selling equity. Further to this, sellers are less likely to accept lower prices for their homes because they have set price points that they need to make in order get the equity to move up. This is the reason we see some homes staying on the market for months without going down on price, then withdrawing from sale all together. The owners simply cannot afford to move unless they achieve a certain amount of profit on the sale that will allow them to purchase another property. It will be interesting to see in 2016, how much inventory there will be. We will need the inventory from move up buyers if the want the number of mortgage buyer to grow. I believe the number of cash buyer in the market will fall again in 2016 as it did in 2015. 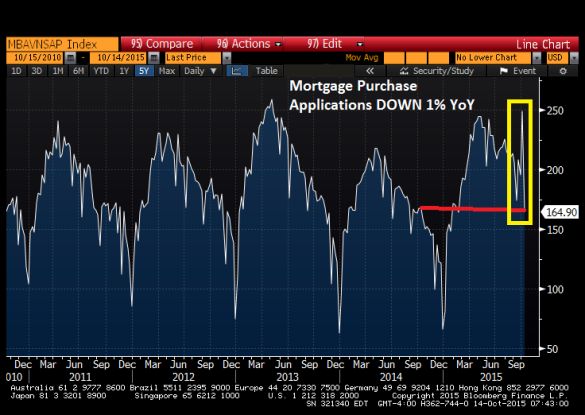 We may even see some months when cash buyers make up less than 20% of the market. This would be a first in this cycle. Lastly, don’t expect TRID (TILA-RESPA Integrated Disclosure rule implementation) to impact purchase applications (either up or down) for the last part of 2015. This new regulations, like all new regulation will have some growing pains but should not affect buyers or sellers. We had a two week massive distortion in the purchase application data due to TRID both up and down. In a week or maybe two, that distortion due to TRID should be played out. Posted in Uncategorized and tagged Down payment, Home Prices, Housing Debt, Move Up Buyers, TRID. Bookmark the permalink.